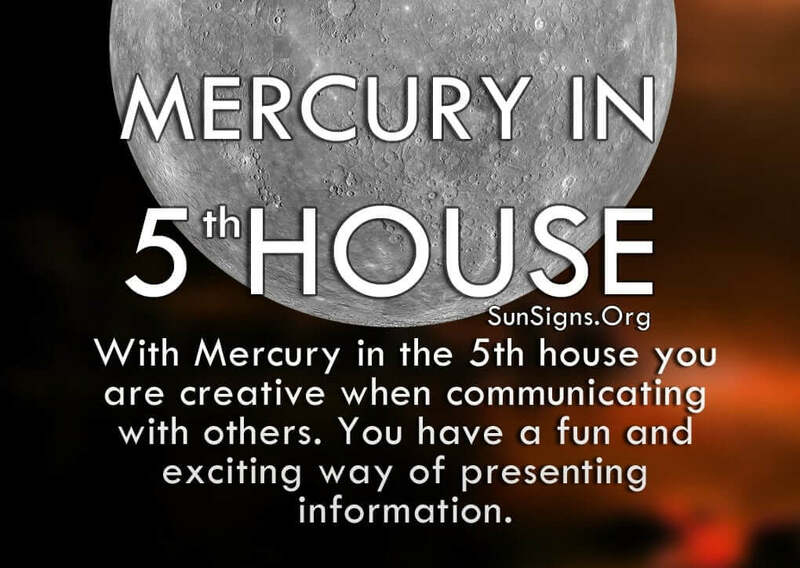 Creativity is your strong suit, and with Mercury in the 5th house you use that when communicating with other people. You have a way of presenting information that is fun and exciting and people are always interested in what you have to say. But make sure you don’t become melodramatic. Planet Mercury in astrology represents intellect, logic, communication, progress and perception. You’ve got that down perfectly. Because of your enthusiasm, you have a way of attracting people’s attention and conveying your thoughts and feelings in a very productive manner. You are smart and entertaining (as Leo is your ruling sun sign), which is quite the effective combination. People like hanging out with you and getting into lively discussions and you never disappoint. Mercury in 5th house meaning shows that you people enjoy comedy. So you’re good at telling jokes or conveying your points in a humorous or witty fashion. And you’ll go so far as to act things out to make the discussion even more engaging. The one area where you really excel in communication is romance. You have a knack for witty banter and playful flirtation, and potential partners flock to you for that very reason. You are fun and adventurous and everything you do exhibits your exciting personality. It’s never a dull moment with you. People are drawn to the way you make everything sound so wonderful. You’re able to explain your feelings in such a way that makes the other person feel like they are the only one in the world for you. And you are so fiercely loyal that this part is not a lie. The only thing the Mercury in fifth house have to be careful about is taking things too far. You also have a large ego, and can cross the line or be hurtful if you’re not paying attention to the reactions of your audience. Everyone loves a good joke, but not at their own expense. The only downside to your artistic conversational skills is that it also makes you an excellent liar. When you tell a story you have a tendency to convey it in such a manner that it seems funnier or scarier or heightened in some way. You do this for effect and to get a reaction, but you also have a tendency to do the same thing with reality. You bend it in such a way that you can get out of something or justify your actions. And sometimes you offer too much and then can’t deliver on your promises, disappointing your audience. Sometimes the only thing required during a discussion are the facts, without all the drama behind it. (Get your Mercury sign astrology analysis to understand yourself better). The Mercury in 5th house astrology suggests that if you’re trying to teach something, then straightforward conversation might get the point across even better. You have to learn how to read your audience and figure out the best way to convey information. That way it’s not about you as much as it is about them understanding what you’re trying to say. Not everything has to be a major production. Sometimes a quiet one-on-one session is all you need. That’s what makes you so attractive. Even though there is a lot of show and tell in the relationship, those around you know you are pure of heart. You don’t mean to hurt anyone. You just want all your loved ones to have a good time. Focus on that aspect of your storytelling, and everything else will fall into place.